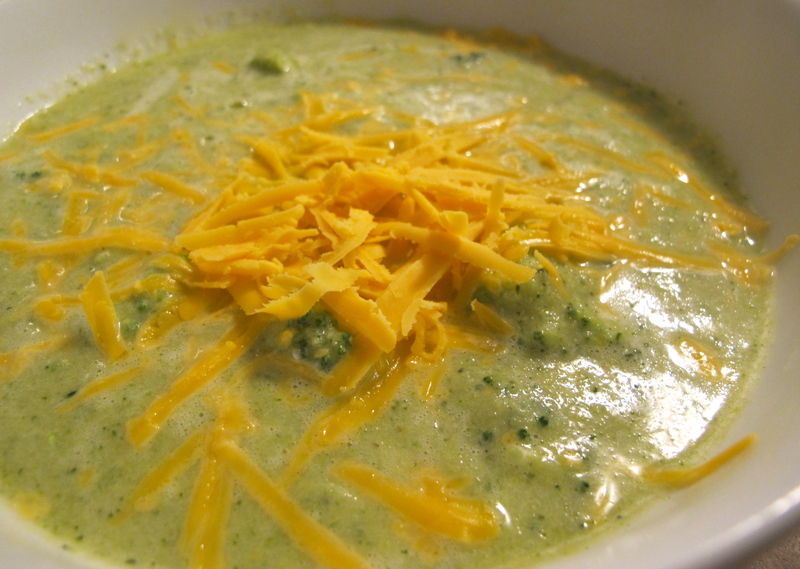 This soup has about 250 calories per 1 cup serving (before the cheese topping), is filling and healthy. It is slightly adapted from a Moosewood recipe. It would be best served with some sourdough bread if that is in your calorie budget/food plan. Optional toppings: grated cheddar, scallions, fromage blanc, etc. Melt butter in large pot, sauté onion and bay leaf with salt over medium heat until onion is clear. Add bell pepper, broccoli, potato, and stock. Bring to a simmer, cover, and continue cooking for 10 minutes, stirring occasionally, until broccoli is well cooked. Discard the bay leaf and purée the soup in batches, adding cheese into the blender at the end. Stir in fromage blanc and spices, bring almost to a boil, top with optional florets (plus cheese or other toppings), and serve. Kate: This looks like a great meal for a cold/snowy day! I assume that you can substitute other vegetables (asparagus, Brussels sprouts, etc.) for the broccoli. PS: Unfortunately, all we have here is sun & warm weather! I’ll have to save the recipe for a trip East!